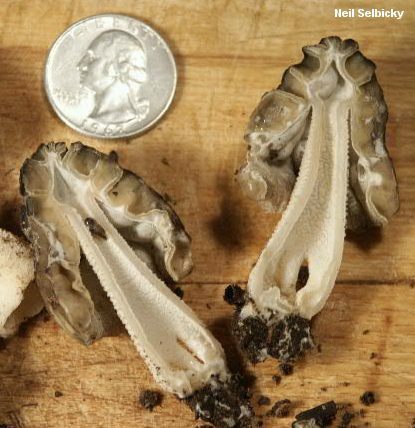 This is the western North American version of what we used to call "Morchella semilibera," the half-free morel--before a recent DNA study (O'Donnell and collaborators, 2011) found support for the idea that Morchella semilibera is a strictly European species, and that we have two half-free morel species on our continent: Morchella populiphila and Morchella punctipes. 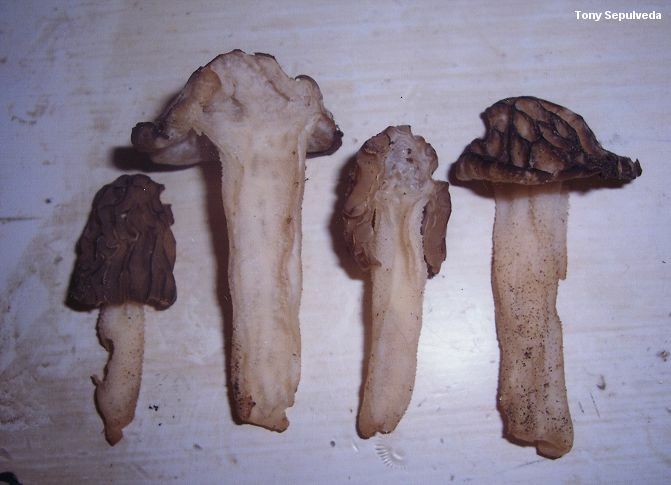 Half-free morels have a cap that is attached (roughly) halfway down the stem, creating a substantial overhang where the margin of the cap hangs around the stem. Verpa bohemica can look similar, but its cap hangs completely free, like a thimble sitting atop a pencil. 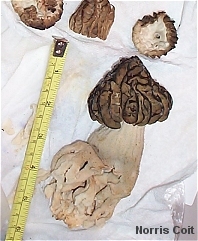 The North American half-free morels cannot be separated by observation of their physical features, with or without a microscope . . . but the species belong to very different ecosystems, separated by a little geographic barrier known as the Rocky Mountains, making identification possible without recourse to expensive DNA testing (unless you have no idea where on this continent your half-free morel was collected, which seems unlikely). 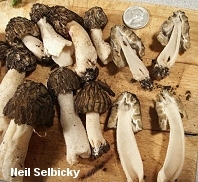 Morchella populiphila is named for its association with Populus trichocarpa, the black cottonwood of northwestern North America. Ecology: Possibly saprobic and mycorrhizal at different points in its life cycle; growing alone, scattered, or gregariously under black cottonwood (Populus trichocarpa) in river bottoms; March to May; northwestern North America. Cap: 2-5 cm tall and 2-5 cm wide; conical or broadly conical; pitted and ridged, with the pits primarily arranged vertically; when young with bald, flattened, honey brown to pale brownish ridges, and whitish to brownish pits; when mature developing flattened to sharpened, dark brown to black ridges and yellowish to brownish pits; attached in a skirt-like manner to the stem, about halfway from the top; hollow. Stem: 2-11 cm high and 1-5 cm wide; often hidden under the cap when young, but lengthening dramatically with maturity; fragile; in warm, wet conditions becoming inflated, especially toward the base; white to watery brownish; usually mealy with whitish granules that sometimes darken to brown; hollow. 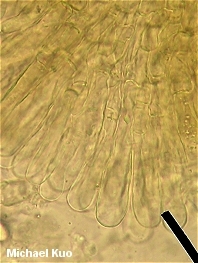 Microscopic Features: Spores 20-25(-29) x 12-16(-18) µ; smooth; elliptical; without oil droplets; with homogeneous contents. Asci 8-spored. 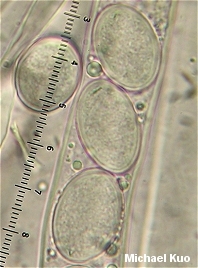 Paraphyses cylindric with rounded, subclavate, or subacute apices; septate; hyaline in KOH. Elements on sterile ridges 100-175 x 10-25 µ; septate; tightly packed in an even layer; brownish to brown in KOH; terminal cell broadly clavate to subrectangular with a flattened to broadly rounded apex. SPECIMENS EXAMINED: Herb. F. 03240401 (holotype), 04010701, 04270501, 03250601. Kuo, M. (2012, October). Morchella populiphila. Retrieved from the MushroomExpert.Com Web site: http://www.mushroomexpert.com/morchella_populiphila.html.